This is the second of my essays about my recent trip to England. One of the goals of my trip to England was to, as much as possible, explore traditional English foods. The last few times I've been in the UK I've had more "ethnic" food. Indian food in the UK can be pretty fantastic, and I've run into some great Moroccan, Japanese, Chinese and other places in London, Edinburgh, and other places, but this time I purposely stayed away from non-British. In this installment, we encounter savory English pastry. I looked anxiously up and down the quaint, oh-so-well-preserved main street of Ironbridge, the little town nestled next to the famous bridge of the same name. My mother had wandered off on her own. Just as I was about to go running up and down the street looking for her, she emerged calmly from a hidden corner, clutching something in her hand. "Some nice gentleman gave this to me" she said, holding out the remnants of some pastry. I swallowed the shock of the fact that my mother (who had lived and thrived for 20+ years in New York City) had been trusting enough to accept food from a total stranger, I peered at the pastry. "What is it?" 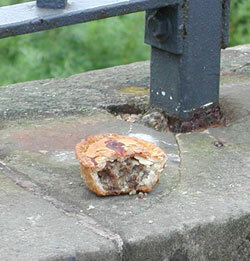 "He said it was an Ironbridge Pasty" she said with her mouth full. She pointed to a suitably pretty Old Fashioned shop on the other side of the street. "He got it from there I think." Cornish pasties were originally miner's food, with sturdy crusts that could be grabbed with grimy hands. 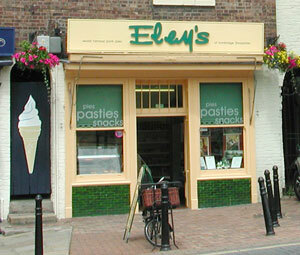 Ironbridge pasties, according to the shop that sells them, similarly originated as lunch for the iron foundry workers. As you can see, it's plump, with a golden crust, a wavy crust edge. It is definitely adorable. The crust - ah, the crust. English pastry crust, if "properly" made, is made from suet (beef fat usually rendered from the fat around the cow's kidneys), and has a distinctive flavor. You simply don't encounter it anywhere else really - most continental European pastries use butter, or sometimes a mixture of butter and lard, and American pastry favors vegetable shortening. A while back I went through a English Cooking phase, and tried to get a hold of suet. Searching the net, the only use for suet nowadays anywhere else seems to be to make those nut-and-seed logs people hang up to attract birds to their gardens. So, only the British people and birds seem to like suet. But I digress. This particular crust was quite thin, which made it rather crumbly but quite good. The filling had rather too much mushy potato for me but was tasty nonetheless. Encouraged by the tasty pasty, we decided to try another typically English savory pastry, a pork pie. A pork pie is round, solid, and filled with a ground pork mixture. It usually has a little hole on the top, and the meat is surrounded with some gelatinous stuff which is like aspic. It's meant to be served cold or at room temperature anyway (pasties and sausage rolls can be heated up). The pork pie from the pie shop was quite tasty, though not as good as the pasty. I couldn't finish the little pie; I suppose that the stomach can only take so much suet pastry. The voracious pigeons that hovered around, however, were quite willing to finish it off for me. Pork pies, pasties, sausage rolls - these savory pastries are quintessentially British. They definitely sit solidly in the stomach. In English cookery books, you read a lot about the importance of making pastry that is "light"; no wonder, because suet pastry that is hard and solid is truly a horror. (We encountered such a rocksolid, heavy pastry, again unfortunately from Tesco's, a few days later.) It's something you have to try at least once though, if you are in England. Ironbridge, dubbed the "Cradle of the Industrial Revolution", refers to the famous bridge itself as well as the restored town that nestles in the astoundingly beautiful gorge. 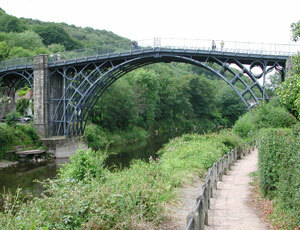 For more information about the site and its great museums, see http://www.ironbridge.org.uk/. Submitted by maki on 2004-08-14 14:56. That pasty looks yummy. I had one of those when I visited the UK years ago. Hopefully, I can get some when I go back next year. I'm enjoying these posts on English food. I've only been abroad once on a non-student budget and hardly ventured farther than BLTs and beans for breakfast. I also really enjoy these posts on English food. I'm a UK university student from Hong Kong and have lived here in England for 10 years. As far as I know, the nice flaky pastry used for pasties and pork pies traditionally uses lard or half lard and half of some other shortening as the fat. Pork pies are made with a rather complicated hot-water pastry that I've never attempted, but I make pasties quite often, using an ordinary short-crust recipe with half of the usual fat replaced by lard. Oh, and the traditional Cornish pasty is filled with potatoes, beef, swede and onion, and seasoned with salt and lots of pepper - people, especially Cornish people, get can quite het up about this, with furious arguments about whether or not carrots are acceptable. Suet is only used in steamed puddings, dumplings and so forth. You can buy beef suet here in London in packets ready granulated, and there is also an acceptable vegetarian version. Great artical, but you fail to include the people who not only eat ,but also MAKE those fantasic pies.All I can say is ,that as a Brit(born and bred in Liverpool,and now living Antwerp),the first thing I do when I hit the English shores to visit my children is to go right into a pie shop,and grab the first pork pie and pastie I can get my hands on ,and once again I,m a Brit reborn. My grandfather (recently past away) was from Cornwell England. Every year around christmas he would treat the family to the most awesome pasties ive ever eaten. I never got the recipe (that only he knew) from him before he passed do to his unexpected death. 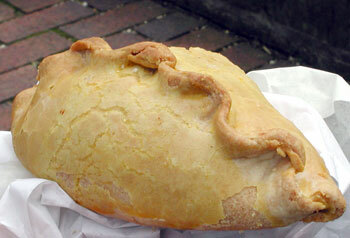 I would love to find a recipe for authentic pasties made with beef suet. If anyone would like to share a recipe it would be greatly appreciated. Thank you.